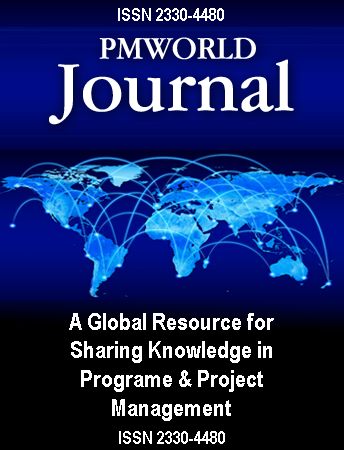 The PM World Journal (PMWJ) is intended to be a resource for students and educators around the world. The PMWJ can provide educational articles and case studies to complement coursework related to program and project management (P/PM). We can provide visibility and support of P/PM research projects, and opportunities to publish the results. We can also provide a high level of visibility for courses, students, professors, PM programs and the universities where they are located. Many articles, papers, case studies, news articles and reports published in the monthly PMWJ can provide excellent supplementary reading for P/PM courses. Our authors have agreed that their works can be downloaded for personal or educational use, so educators should feel free to use PMWJ content for teaching purposes. We also encourage both educators and students to contact individual authors for more information; most will appreciate the feedback and personal contact. For professionals studying for certification exams or recertification requirements, reading and studying papers in the PMWJ might earn credits for continuing education. The easiest way for PMWJ to be useful to your students is to make them aware of the publication and website. Refer your students to www.pmworldjournal.net. Discuss some of the contents or papers in class. Research related to P/PM can be showcased through news articles in the monthly PMWJ. We can also provide direct support of individual research projects, by publicizing the research, highlighting research or survey needs and providing links to research-related websites or contacts. While the PMWJ is not a refereed journal, it is a professional publication with a reputation for highly experienced and qualified authors, a strong network of global advisors, and a commitment to high quality and professional content. We also provide an easy and straightforward means of publishing articles and papers related to P/PM. If you have research, models, methodologies, experience or other knowledge to share, consider submitting a paper for publication in the PMWJ. If a peer review is not necessary, let us publish your work and help you share your knowledge worldwide. Educators can gain visibility and positive publicity in the PMWJ for their PM programs and universities in several ways. When authoring an article or paper, the university can be highlighted with the profile of the author. We can also publish news articles about schools, PM courses, professors and PM events at universities. If you would like your school to be more visible around the world of professional P/PM, consider submitting an article or paper for publication in the PMWJ. For more information, contact editor@pmworldjournal.net.